Located approximately thirty miles outside of Santa Fe, New Mexico, the towns of Los Alamos and White Rock are both located in Los Alamos County and are equally excellent places to call home. Stunning natural beauty surrounds both towns, and you will find ample opportunities to enjoy the outdoors when you choose to live in the area. 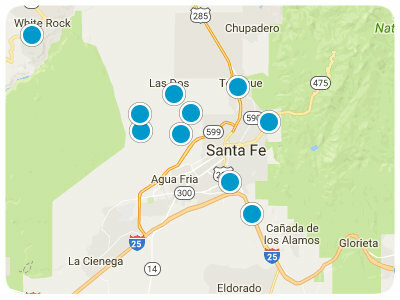 Available properties in Los Alamos and White Rock are primarily single-family homes, but condos and townhomes are also available. Homes for sale in the area encompass a wide variety of sizes and styles, so you will be able to find something that fits your budget and personal preferences. When you are a resident of the area, gorgeous natural beauty will lie practically right outside your front door. For example, the proximity of the impressive Valles Caldera National Preserve ensures that you will always have something new to discover. Exhilarating hikes, invigorating strolls, and picnic lunches with spectacular views can become part of your everyday life when you live in Los Alamos or White Rock. Furthermore, White Rock Canyon is an additional option for soaking in the warm sunshine. This canyon provides visitors with the chance to spot rare plant and wildlife species, and it also offers outstanding views and opportunities for rock climbing. When you are ready for a more metropolitan adventure, you can travel the short distance to Santa Fe. This arts hub offers plenty of cultural attractions, and its farmers market is also an excellent place to spend some time. Whether you are hiking at White Rock Canyon or attending an incredible performance at the Santa Fe Opera, you will be happy to think of your fabulous single-family home, condo, or townhome in Los Alamos or White Rock awaiting your return. You will be proud to call one of these towns home, and you are certain to appreciate the fantastic residences, lovely natural scenery, and plentiful entertainment opportunities that exist in the area. White Rock and Los Alamos real estate options are ready to impress you. If you are ready for more information regarding single-family homes, condos, and townhomes for sale in White Rock and Los Alamos, New Mexico, please do not hesitate to contact us.